Essential plot rundown: After being banished from Asgard to Earth, Thor must confront his brother Loki and redeem himself. Before I saw this, I knew nothing of Thor other than he was an Avenger. And I also thought he looked stupid. Boy, did this movie prove me wrong. Thor is actually a pretty sweet character. I thought the casting and acting was great. I had never heard of Chris Hemsworth (Thor) or Tom Hiddleston (Loki) before watching Thor, so I did not know what to expect. And I was not disappointed. Each actor completely becomes their character and brings them to life. 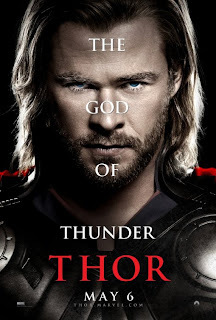 I believed that Thor was an arrogant, well intentioned person from another world. Hiddleston did a great job portraying Loki as a complex antagonist with internal struggles and motives. I could totally sense Loki's inner turmoil. They both did a good job. The supporting characters were good too. Except for Darcy's character. She's just dumb and annoying. The story was well written as well. It's a little bit more complicated than your average action movie, which is nice. The inclusion of S.H.I.E.L.D. was handled properly. Their involvement felt like a natural part of the story as opposed to only being included as a precursor to The Avengers. (Which was a problem I had with Iron Man 2). There was also good balance between Earth and Asgard. I've heard some people complain about the opening battle sequence against the frost giants. Typically, the action getters bigger throughout all the movie, building up. But this fight was the biggest of the whole movie and happened right at the beginning; thus going down hill from there. But I was ok with that. I saw this fight more as character development than an action scene. It portrayed Thor's arrogance and hot headedness. I didn't really have any complaints with Thor. However, the camera work did bug me a little. It seemed like every establishing shot was framed as a dutch angle; so everything was tilted. I never really saw the purpose to this other than to mix things up a little. It didn't seem motivated to me. But that's just a small thing. So overall, Thor is a great watch. Great acting, good story, good SFX. It is a lot of fun. Out of all of the The Avengers precursor movies, I can't decide if I like this or Iron Man the best.